FreeDuplicateRemover is a small freeware application utility which makes quick work of removing duplicate files. It checks the content of files and removes them if they are duplicates. Installation of this program is easy and straight-forward and so is actually using it. 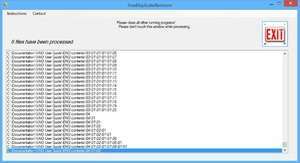 Before you run this program and check for duplicate files, it is highly suggested that you close all other programs beforehand. Version 4.7 is a freeware program which does not have restrictions and it's free so it doesn't cost anything. For security reasons, you should also check out the FreeDuplicateRemover download at LO4D.com which includes virus and malware tests. Additional screenshots of this application download may be available, too.